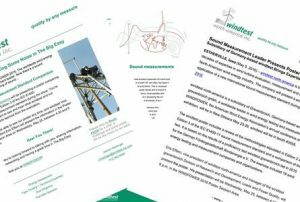 windtest north-america is a subsidiary of windtest grevengroich gmbh, Grevenbroich, Germany, a worldwide leader in wind turbine evaluation, measurement and validation. The company has been engaged in the North American wind energy industry for the past 10 years and has completed more than 40 projects in the United States. windtest established windtest north-america in 2014 on the Estherville campus of Iowa Lakes Community College. I am consulting with windtest north-america on American language and marketing processes, helping with material development for trade shows and sales efforts, and to build and fortify a reputation in North America like that enjoyed by its parent company in Asia, Europe and other parts of the world. While building on the strong foundation of windtest, we want to make sure its messaging is accessible and relatable to the North American customers and prospects. The line, “quality by any measure” combines high quality, what windtest has a reputation for and delivers in every interaction and aspect of its business, and measurement, the core of the company’s service offerings. It also allows the company to talk about quality – which everyone says but for which windtest is actually known – in a more unique, interesting way. By incorporating the American idiom “by any measure,” it provides a compelling, memorable statement that is immediately familiar to most people in windtest north-america’s target audience. “By any measure,” with its meanings related to “in every way,” is also a lead-in to other elements of the company’s culture. For example, in every way (consultation, responsiveness, customer service, measuring, testing, etc. ), windtest delivers high quality. By extension, “quality by any measure” provides the basis for talking about other qualities of your company: windtest is reliable by any measure; the testing it does is precise by any measure; its customer service is exemplary by any measure; it is responsive by any measure; by any measure, it consistently delivers valuable data; and so on.